MCF Community Church has been involved in missions work in Nicaragua since 2008 through a partnership with Verbo Ministries and Pastor Earl Bowie. In Matthew 28:18-20, Jesus’ last words on earth commanded us to share the Gospel with the entire world. MCF takes this command seriously. Through our bi-annual missions trips, we have witnessed an amazing transformation in lives and basic living conditions as the hope of Jesus is changing hearts and lives. You are encouraged to come and experience an unfolding miracle in Nicaragua. Over 85% of Nicaraguans are unemployed. Through two feeding centers, Verbo ministries provides lunch for nearly 800 children five days of the week while teaching them basic hygiene and sharing the hope of Jesus. MCF’s mission teams have the privilege of helping to distribute this essential meal. Ten years ago when MCF began partnering with Pastor Earl, the conditions were deplorable. Since them, MCF in partnership with other churches, have helped provide funds and helped build new dorms for both the boys and girls along with a new kitchen and cafeteria. They now have working indoor plumbing and toilets. MCF makes history! 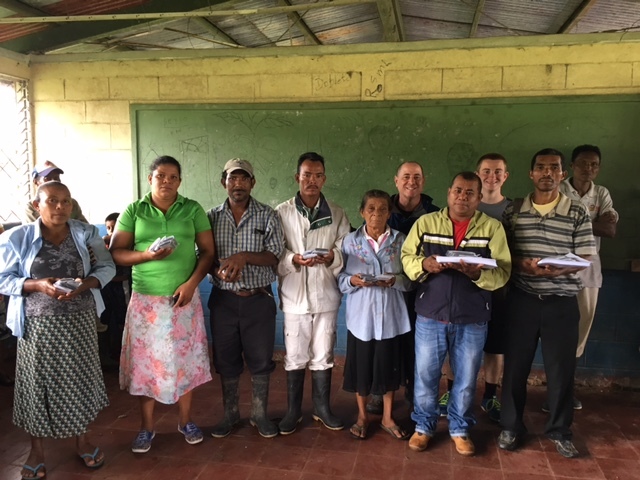 At noon, January 6, 2018 in the community of Krin Krin, MCF completed the distribution of the Miskito Bible along the 500 mile Coco River bordering Honduras and Nicaragua. To our knowledge, this is the largest Miskito Bible distribution ever done. Every local community received a copy of the Bible in their native language. 3160 Miskito Bibles & 500 audio Bibles were distributed (audio Bibles were donated by InTouch Ministries and Leading The Way Ministries). In addition, MCF developed the first Bible resources in Miskito-2 Bible reference sheets containing 75 topics and a one year Bible reading plan-a combined total of over 6300 copies were distributed. A copy of the Miskito Bible was donated by MCF to the Museum of the Bible in Washington, DC and is on display. Revival is happening in the prison. Although the conditions are deplorable, Jesus is changing hearts and lives. In January 2019, MCF participated in the first baptisms ever done in prison.